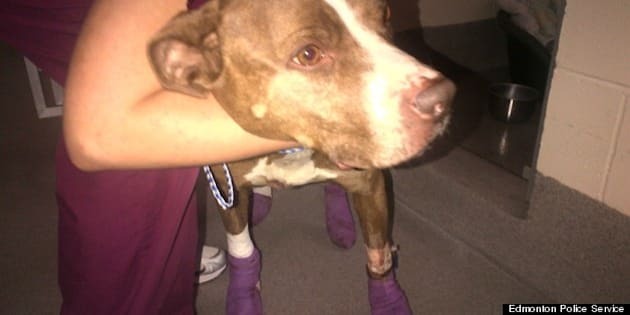 EDMONTON - Edmonton police have charged a man after a dog was dragged behind a pickup truck on the city's north side earlier this week. Police said Friday they charged a 33-year-old man under the Animal Protection Act. Const. Mandy Squire said for criminal charges to be laid there would have to be evidence of wilful intent, something police said they don’t have. The six-year-old female dog named Nalla, was in the care of the accused when the alleged incident occurred, but police say he is not the owner. The accused has been scheduled to appear in court in June to face a fine that has yet to be determined. Squire said in a press release that the dog is currently receiving 24-hour medical care, including numerous surgeries to heal the bottom of its paws. Police said they’re still finalizing how the public can help cover Nalla’s medical costs, which could end up being as high as $10,000, and the information will be on the Edmonton Police Service Facebook page.